October is here again a month were PINK is in and awareness of Breast Cancer heightens. In 2005 I had a rough year and life was slightly crappy just one calamity after another every-time I would fall I would get up again and like a championship boxer take the next punch full on and again would be tumbled to my knees! Yet every time I refused to let life get me down and make me stay down so after being sexually assaulted in Boqueron one late evening after breaking my collar bone 2 months prior to that incident and also a failed relationship I found my self in the home of Jon and Ily Foster who were good friends of mine as well as sponsoring my crazy long events. I was depressed, as well as the broken collar bone I felt violated and my freedom had been stripped from me. I hit a low time my friend Ily took me to a gym in Isla Verde called Curves I was adamant I did not want to go to a gym for 30 minutes, I had not been training and was just depressed yet needed to find my path again...So I ended up at Curves did my 30 minutes work out and then due to the right moment my life was about to change..... as AVON of Puerto Rico General Manager Jose Quinones was giving a talk on Breast Cancer awareness and the AVON Crusade Against Breast Cancer. I told Ily that I did not have money to help with the campaign but would happily give AVON my legs to run for a cause.......that is when Ily went to Jose Quinones and asked for a moment to talk. The next thing I knew I was at AVON HQ in San Juan and I was going to be an AVON athlete. AVON be a winner for the Crusade against Breast Cancer 2006 Hawaii Ultraman. Day 3 the finish of a 52.4mile run. Posters were made and a press conference followed I was suddenly against all odds going back to Hawaii for Ultraman number 8 wearing PINK! There was still a lot of work to do as breaking my collar bone and a relationship that failed had left me without a few tools of my trade so I began making calls to several companies who had always supported my triathlons and ultras and one month before Ultraman Hawaii I had been in the press for AVON, Aegis Bikes had given my a beautiful frame and fork, Hammer Nutrition gave me new uniforms and gels powders and e caps for my journey to Ultraman and Brooks USA gave me pink shoes and pink running gear! Serfas gave me tires, Aquaman gave me a wetsuit and Polar gave me a new monitor, Spinergy Wheels gave me a smoking deal on wheels and Rudy Project supported me with Helmet and glasses, Compex Sports gave me a beautiful new unit to help strengthen my muscles around my collarbone injury and a new Monitor from Polar USA arrived I was amazing the support I had and Jon Foster of Hawaiian Tropic took care of airfare and his family adopted me. Since 2005 November I have continued to swim bike and run for AVON of Puerto Rico up until the end of September 2011. Due to several reasons I am hoping to continue the Crusade against Breast Cancer with AVON now that I live in Southern California and encourage women all all the World that life is precious and worth fighting for! I have had many problems in life made some mistakes but live with no regrets! 5 years and 11 months wearing Pink and raising awareness of Breast Cancerthrough my sports of swimming, cycling and running. In total I have raised the grand sum of $93,210.00 for AVON of Puerto Rico for mammograms for the women of Puerto Rico, the money was given to the American Cancer Society of Puerto Rico by AVON of Puerto Rico. Meeting women with Breast Cancer or friends and families of those affected by Breast Cancer and hoping and knowing I am making a difference in the lives of many people all over the World. 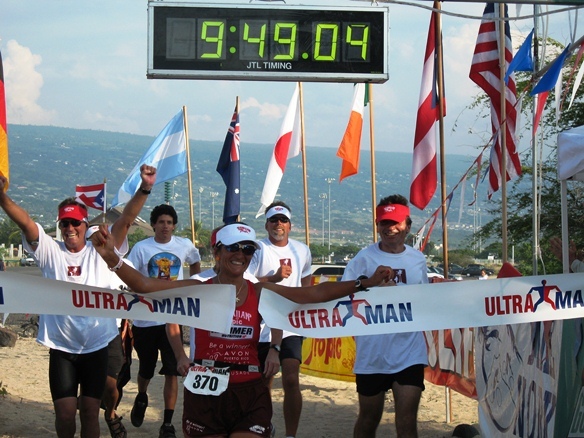 As October comes around more and more women will be wearing PINK and families and individuals will take note on the importance of Breast Cancer month, with that said I would like to share a few videos of my finish at Ultraman Hawaii 2005 and 2007. In 2010 I went to the TOP of the Mauna Loa Volcano on the Big Island of Hawaii there is no place too remote to advertise the importance of the AVON Crusade against Breast Cancer. My Photo on the wall at AVON of Puerto Rico in San Juan. Here I am with Jose Quinones in 2006 at AVON of Puerto Rico.